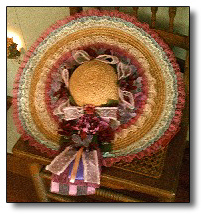 Medium large country decor wall hat, or wear for special occasions. White lace border, inner border lace cream and yellow, white lace crown, yellow and white flowers, yellow and white ribbon and lace streamers. Large Victorian décor wall hat, or wear for special occasions. 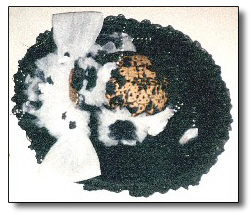 Black velvet brim with double black lace border, sheer black lace crown, large white organdy bow, with white and black flowers. Medium large fuchsia Star Bud hat to wear. 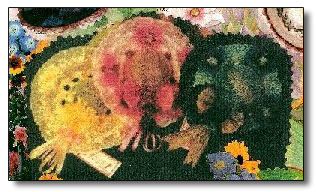 Star Bud corsage comes off to wear or can remain on the hat. Large country Victorian décor wall hat, or can be worn for special occasions. 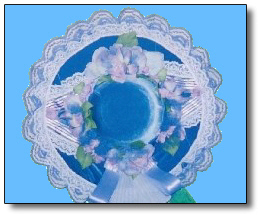 Double white eyelet lace border, blue and white lace on brim, white lace crown, blue and light green carnations and small blue flowers, blue ribbon and white lace streamers. 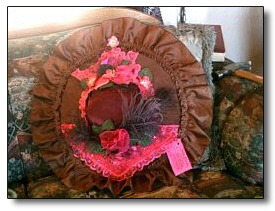 Medium large country décor wall hat, or can be worn for special occasions. Double white lace border, inner border peach and white lace, white lace crown, gold, amber and light brown flowers, peach and gold streamers. Large Victorian décor wall hat, or can be worn for special occasions. lilac and purple double lace border, lilac and taffeta brim and crown, burgundy net, lilac, pink and purple flowers. 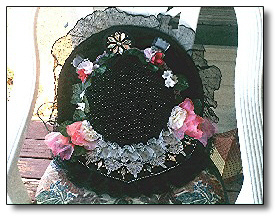 Medium large Victorian décor wall hat. 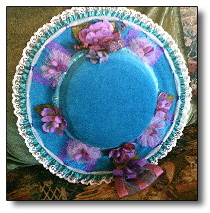 turquoise velvet brim and crown, purple and lilac flowers, lilac net, purple and lilac double streamers. 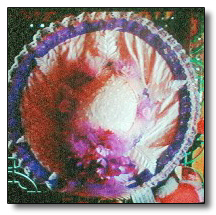 Large country décor wall hat. 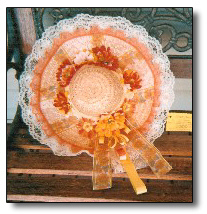 straw crown, yellow and sheer white lace border, lots of gold, white and yellow lace net around rim. 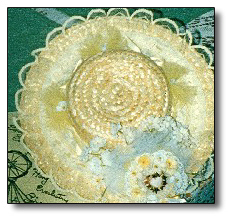 The Star Bud corsage can be worn or left on the hat. 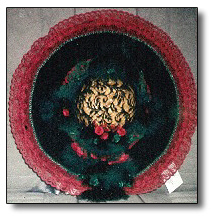 Large Victorian décor wall hat. purple and lilac scalloped lace border, iridescent blue and purple brim and crown, lilac, blue and pink flowers, lilac and purple ribbon streamers. Large two tone brown velvet background with two inch brown satin border, pink satin insert with roses and other pink flowers, brownish grey Ostrich feathers. Medium large country Victorian décor wall hat. 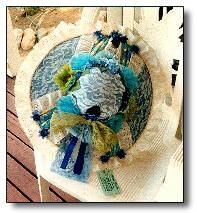 sheer blue lace border, lots of two toned blue net around brim, two toned blue flowers, Star Bud can be worn or left on the hat. Medium large country Victorian décor wall hat. Triple fuchsia, pink, peach lace, sheer lilac loops, bow and streamers, burgundy, pink and peach flowers. Large country Victorian décor wall hat or can be worn for special occasions. Triple burgundy lace border, black velvet inner brim, sheer black lace crown, lots of black and burgundy net, small burgundy satin roses, black lace streamers, black ribbon. 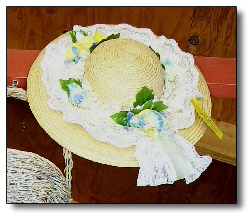 Medium large country décor wall hat set with basket to match. Triple white and peach lace border, white lace brim, peach, yellow and pink flowers, white and peach ribbon and lace streamers. Medium large country Victorian décor wall hat. 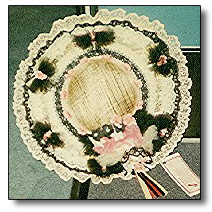 Light pink double lace border, white lace inner brim, straw crown, black net bows, black and pink flowers, black and pink streamers. 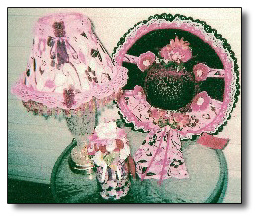 Large Victorian décor wall hat and basket to match. 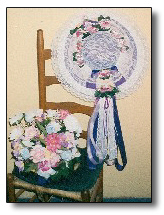 Triple white lace brim, white lace over crown and inner brim, pink, purple, white and blue flowers, purple satin and white lace, long streamers. Medium large Victorian décor wall hat. Crystal lamp and bottle. Black and pink lace border on hat, deep burgundy velvet brim and crown, pink and burgundy floral print chiffon on lamp, hat and streamers, burgundy and pink flowers. 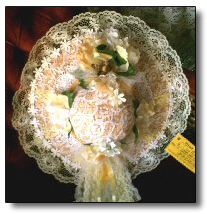 Large Victorian décor wall hat. 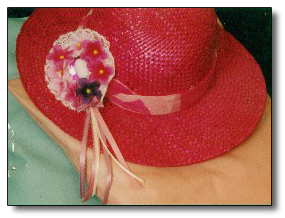 Sheer black lace border, black lace brim and crown with sparkles, pink and fuchsia roses, large rhinestone flower on top, gold beads, ruffled trim on bottom of hat. Medium large country décor wall hat or to wear. 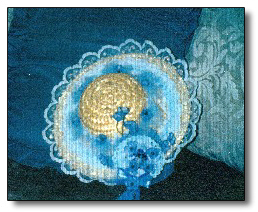 White lace around crown, blue and yellow flowers, yellow ribbon and white lace streamers. Medium country décor wall hats. Set of three or three single hats. 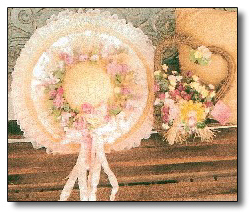 Yellow, pink and black hats with lace borders, lots of netting and satin ribbon streamers. Contact Ann if you only want one or two hats.